CHICAGO – The Hollywood Foreign Press Association announced the nominees for The 66th Annual Golden Globe Awards this morning and jaws dropped at some of their choices and some of their exclusions. Somewhat surprisingly, “The Dark Knight” was left out of the Best Picture category, but far more shockingly, “Milk” was also off the short list. Both films did get a single acting nomination - for Heath Ledger and Sean Penn, respectively - but the confusing awards season was made increasingly more so this morning by the HFPA. The big films of the year for the HFPA were “The Curious Case of Benjamin Button”, “Doubt”, and “Frost/Nixon”, all of which landed five nominations. “The Reader”, “Revolutionary Road”, “Slumdog Millionaire”, and “Vicky Cristina Barcelona” all followed with four nods a piece. Stars like Tom Cruise, Robert Downey Jr., Meryl Streep, Penelope Cruz, Kate Winslet, Leonardo DiCaprio, Brad Pitt, Angelina Jolie, and even Mickey Rourke will all walk the red carpet as film nominees. A pair of fantastic actresses landed two nominations with Meryl Streep picking up nods for “Doubt” and “Mamma Mia!” with Kate Winslet up for two with her turns in “Revolutionary Road” and “The Reader”. 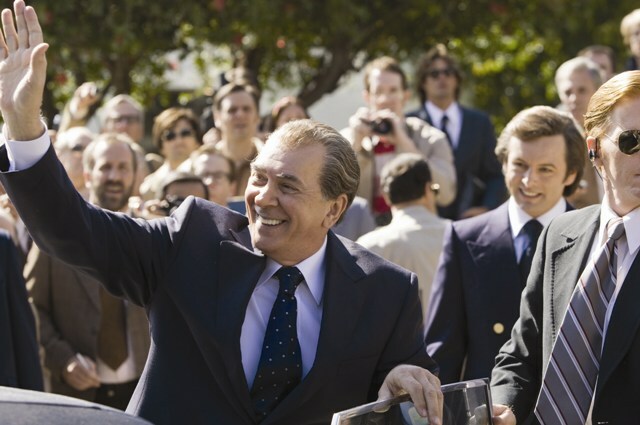 Richard Nixon (Frank Langella) greets an audience while David Frost (Michael Sheen) looks on. Photo credit: Ralph Nelson Copyright: © 2008 Universal Studios. All Rights Reserved. On the dramatic side of the nominations, “Milk” and “The Dark Knight” were replaced by somewhat surprising nominees “The Reader” and “Revolutionary Road” for Best Picture (Drama), alongside the more expected choices of “The Curious Case of Benjamin Button”, “Frost/Nixon”, and “Slumdog Millionaire”. Many of the Best Picture nominees were represented in the acting choices with both stars of “Revolutionary Road”, Leonardo DiCaprio and Kate Winslet, making the top five in their respective categories. Brad Pitt for “Benjamin Button” and Frank Langella for “Frost/Nixon” will compete with DiCaprio along with Sean Penn in “Milk” and Mickey Rourke in “The Wrestler”. Winslet will go up against Streep in “Doubt”, Anne Hathaway in “Rachel Getting Married”, Angelina Jolie in “Changeling”, and Kristin Scott Thomas in “I’ve Loved You So Long”. Woody Allen’s “Vicky Cristina Barcelona” was clearly well-liked by the HFPA, awarding the film nominations for Best Picture (Comedy/Musical), Javier Bardem for Best Actor in a Comedy, Rebecca Hall for Best Actress, and Penelope Cruz for Best Supporting Actress. “Vicky” will compete with “Burn After Reading”, “Happy-Go-Lucky”, “In Bruges”, and “Mamma Mia!” for the big prize. 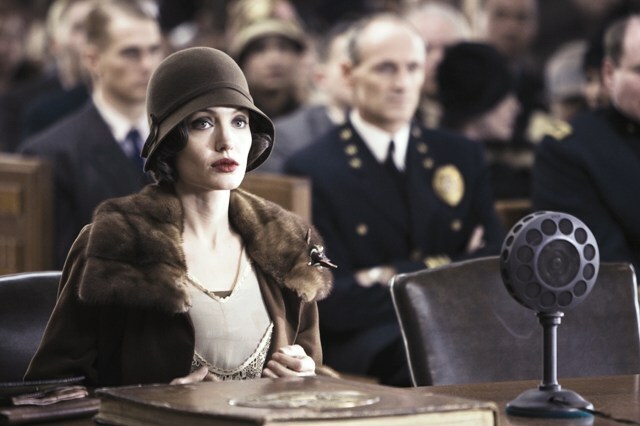 Angelina Jolie stars as Christine Collins in the provocative drama from director Clint Eastwood, “Changeling”. Photo credit: Tony Rivetti, Jr. Copyright: © 2008 Universal Studios. All Rights Reserved. Two actors from “In Bruges”, Colin Farrell and Brendan Gleason, will compete with Bardem for Best Actor with James Franco in “Pineapple Express” and Dustin Hoffman in “Last Chance Harvey”. Hall will have to beat Sally Hawkins in “Happy-Go-Lucky”, Frances McDormand in “Burn After Reading”, Streep in “Mamma Mia!”, and Emma Thompson in “Last Chance Harvey” to take home the Golden Globe. Supporting nominees included a shocking nomination for Tom Cruise in “Tropic Thunder”, Robert Downey Jr. in the same movie, Ralph Fiennes in “The Duchess”, Philip Seymour Hoffman in “Doubt”, and Heath Ledger in “The Dark Knight”. Cruise was funny in “Thunder” but nominating him over Eddie Marsan or any of the acclaimed supporting cast in “Milk” was the biggest shock of the morning. On the actress side, Penelope Cruz will compete with Amy Adams and Viola Davis in “Doubt”, Marisa Tomei in “The Wrestler”, and Kate Winslet in “The Reader”. The nominees for Best Director mirrored the nominees for Best Picture (Drama) and left Christopher Nolan and Gus Van Sant without a chance to win - Danny Boyle for “Slumdog Millionaire”, Stephen Daldry for “The Reader”, David Fincher for “The Curious Case of Benjamin Button”, Ron Howard for “Frost/Nixon”, and Sam Mendes for “Revolutionary Road”. 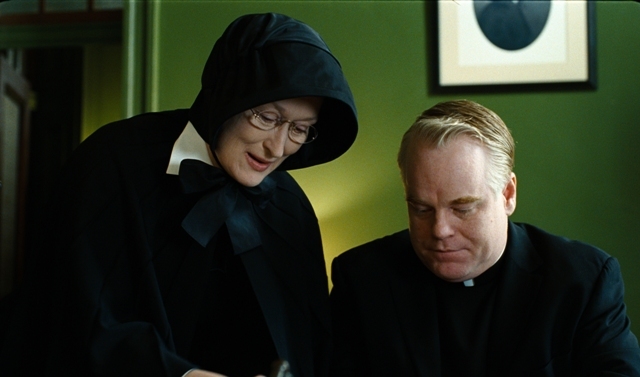 Meryl Streep as Sister Aloysius and Philip Seymour Hoffman as Father Flynn. The nominees for Best Foreign Language Film are “The Baader Meinhof Complex”, “Everlasting Moments”, “Gomorrah”, “I’ve Loved You So Long”, and “Waltz With Bashir”. The screenplays in competition are close to the same as Best Picture (Drama) with one change - “The Curious Case of Benjamin Button”, “Doubt”, “Frost/Nixon”, “The Reader”, and “Slumdog Millionaire”. TV nominees for the Golden Globes were a lot more predictable with “30 Rock” and “Mad Men” leading the comedy and dramatic sides with relatively few newcomers. HBO’s “True Blood”, nominated for Best Drama, was the only freshman candidate in the Best Drama category. “Entourage”, “In Treatment”, “Recount”, “Californication”, “The Office”, “Weeds”, “Dexter”, and “House” were all nominated as well.